Keeping your Spring Valley home's gutters in good repair is a necessity to protect your home from water damage. Siding, windows and your very foundation are at risk of your gutters are not draining properly, do not have adequate downspouts or are leaking at the joints. Hiring the professionals at On Time Remodeling Corp to repair your gutters in Spring Valley is the most simple, cost-effective way to ensure they will do their job to protect your home investment. On Time Remodeling Corp repairs Spring Valley gutters, keeping them free of debris and directing water away from your foundation. Keeping your gutters free of clogs will protect your doors, siding, windows and foundation from water damage. Since 2008, On Time Remodeling Corp has been repairing loose, leaky gutters in Spring Valley and installing gutter downspouts to direct water away from homes. Preventing gutter overflow, On Time Remodeling Corp's gutter repair professionals help prevent water damage to the exterior of your home and its foundation. Unclogging & Gutter Capping – On Time Remodeling Corp clears gutters in Spring Valley and can keep them PERMANENTLY free of debris by installing Gutter Guards. Gutter Cleaning – Once the gutters are cleared of leaves and other debris, we will thoroughly clean the interior, providing for proper drainage. Spring Valley Gutter Repair – On Time Remodeling Corp will repair all broken components of your gutter system and ensure it operates properly. Replace – The On Time Remodeling Corp can also replace any damaged portions of your gutter system that cannot be repaired. Install – Ask us about installing a new, maintenance-free gutter system to protect your home. 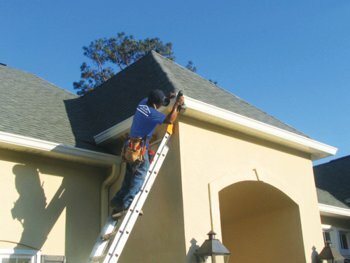 Affordable Gutter Repairs In Spring Valley – Gutter cleaning, repair and installation does not have to be expensive. Work by On Time Remodeling Corp is performed at a competitive rate. We stand behind our work and offer a satisfaction guarantee. On Time Remodeling Corp is proud to serve as the area's leading provider of gutter cleaning services for the last 11 years. We'll put our knowledge to work for you, repairing and installing home gutter systems that perform as they should to protect your biggest investment. Call On Time Remodeling Corp at (914) 200-1324 for your free quote today!